Thankful, originally uploaded by Lukasmummy. 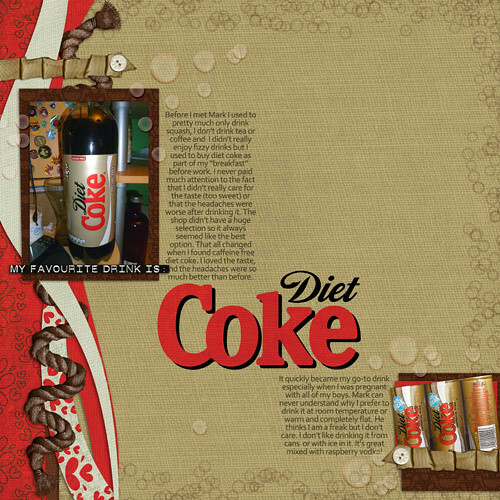 Credits: Layered template (September 2010, Template Challenge) by Aimee Harrison (Girlboheme Studio), Bracketed Sentiments by Katie Pertiet and January Love by Jewel Goodwin (Mad Genius Designs). Font is Segoe Print. 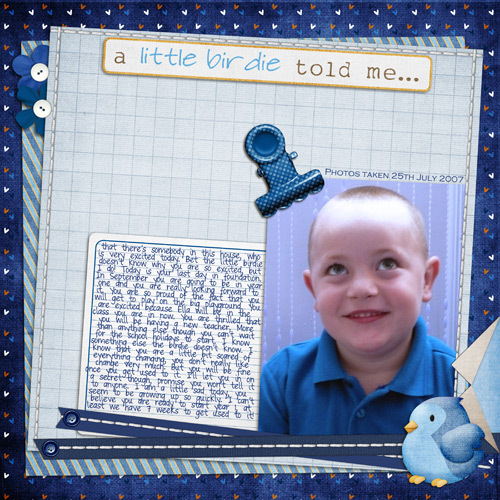 Journalling reads: Having two premature babies before Logan gave us a different perception of what a “normal” birth experience was. We were prepared for him to be born early, to be tiny and to be rushed straight to special care. Then he surprised us all he wasn’t anywhere near as small as we had expected he seemed to have nothing wrong with him and for the first time, our baby was handed to us for cuddles, not only in the ambulance on the way to hospital but once we got there too. He was even allowed to stay with me and come up onto the ward. Lukas got to come and visit with Nan, Lisa and Ella and to be honest it seemed a little bit too good to be true. None of us realised how thankful we would end up being for these photos, when our “normal” again got ripped out from under us. Logan went to special care for a blood test and ended up being admitted. It seems stupid but this was our hardest special care stay, he didn’t look sick like Lukas and Leo had. He didn’t need help breathing or staying warm. Special care’s rules meant that Lukas wasn’t allowed to visit and it was so difficult balancing the desire to be with Logan and the need to care for Lukas especially since we had no help. It was 13 long days before we were finally able to start being a real family, and bring Logan home. Grumpy Lil Pumpkin, originally uploaded by Lukasmummy. Credits: Layered template (Everyday Templates, Template 3), Happy Halloween and Not The Doctor Alpha all by Laura White (C.W Picket & Company). Font is Cutie Pop. 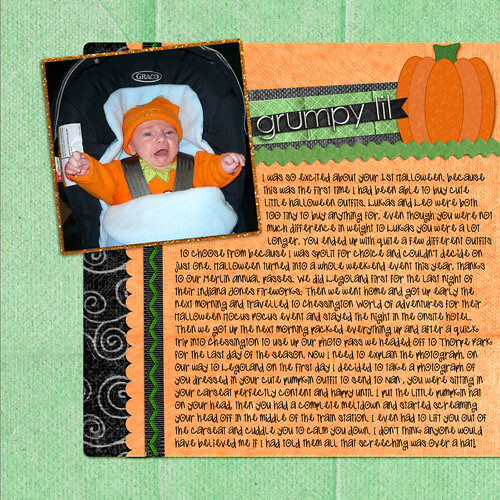 Journalling reads: I was so excited about your 1st Halloween, because this was the first time I had been able to buy cute little halloween outfits. Lukas and Leo were both too tiny to buy anything for, even though you were not much difference in weight to Lukas you were a lot longer. You ended up with quite a few different outfits to choose from because I was spolit for choice and couldn’t decide on just one. Halloween turned into a whole weekend event this year, thanks to our Merlin Annual passes. We did Legoland first for the last night of their Indiana Jones Fireworks. Then we went home and got up early the next morning and travelled to Chessington World Of Adventures for their Halloween Hocus Pocus event and stayed the night in the onsite hotel. Then we got up the next morning packed everything up and after a quick trip into Chessington to use up our photo pass we headed off to Thorpe Park for the last day of the season. Now I need to explain the photograph, on our way to Legoland on the first day I decided to take a photograph of you dressed in your cute pumpkin outfit to send to Nan , you were sitting in your carseat perfectly content and happy until I put the little pumpkin hat on your head, then you had a complete meltdown and started screaming your head off in the middle of the train station. I even had to lift you out of the carseat and cuddle you to calm you down. I don’t think anyone would have believed me if I had told them all that screeching was over a hat!